Many steps contribute to a journey, towards quality youth work at the local level. The strength of Europe Goes Local lies in the synergy between European and local interventions. A lot of the discussions happen at national meetings and events, inspired by the work at European level. This way Europe trickles down to the local level. The Croatian Erasmus+ National Agency consulted 21 local self-governance units (mayors, deputy mayors and heads of department of 21 towns and municipalities) who are actively involved in Europe Goes Local. They received a self-evaluation questionnaire about their capacity, potential and needs for establishing a system of local youth work. 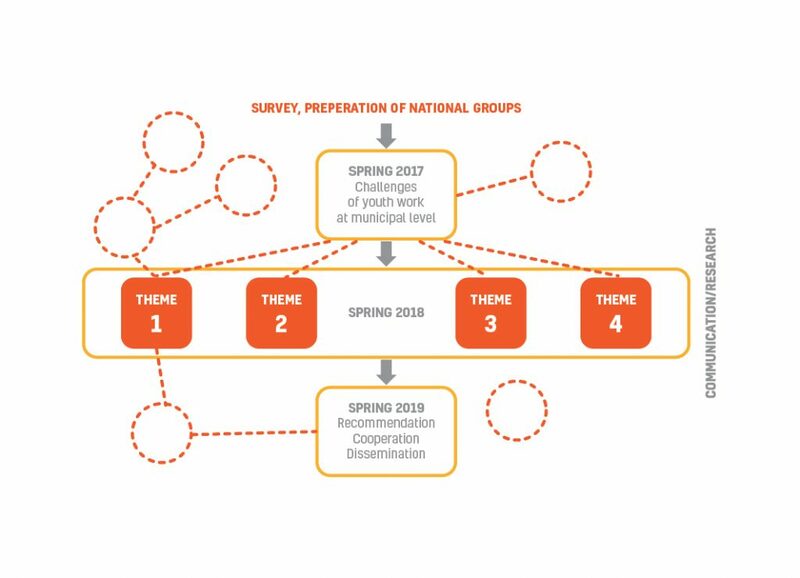 The initial analysis of the questionnaire was presented to a preparation group composed of 2 representatives of the Erasmus+ National Agency, 4 EGL working group members and 2 trainers.Together they prepared the central EGL activity for 2018: a national seminar on youth work for local governance units (towns and municipalities). The trainers were present to develop the concept of the seminar. And deliver it later in the year. 10 youth work representatives from Latvian municipalities visited Tartu City Government and two youth centres in Tartu (one municipal youth centre and one NGO). The participants discussed youth work structures in place, funding schemes, the work of the youth council, mobile youth work and influence patterns in local youth work (lobbying). They Latvian delegation also went out to a youth centre in Rõuge in the south-east of Estonia to discover how youth work is done in a more rural setting. There were enlightening discussions about the definition of youth work, the different types of youth work organisations and youth work legalisation in Estonia. The Italian Erasmus+ National Agency invited 50 youth workers and local administrators from all over Italy to discuss the European Charter on Local Youth Work. In smaller working groups the delegates elaborated a national consultation plan for the charter. The participants were introduced to the Europe Goes Local project from a European and national perspective, but they also became familiar with national research on youth work and the youth worker profiles that exist in Italy and Europe. A nice mix of input and action. The Estonian Erasmus+ National Agency gathered 10 youth work specialists from 3 active municipalities to discuss the work on the European Charter on Local Youth Work. The participants also made a need analysis of youth work in their municipality and possible activities to strengthen local youth work. Each municipality will develop their action plan by the end of March 2018. Send your updates to Judit Balogh, EGL coordinator.